The first word of mouth marketing event that I ever attended was in November of 2007 in Las Vegas. I didn't know what to expect, but I'd met one of the organizations founding fathers and trusted his recommendation when he told me it would be a great place to learn, share, and network with thought-leaders. It wasn't easy, but I found the money in our budget, booked the flights, registered at the event hotel, and took three days away from the office to discover WOMMA Summit. It was everything that I hoped it would be and more. When I returned home, I shared what I'd learned and our team was able to put pieces and parts into effect right away. I haven't missed a WOMMA event since. They continue to inform and inspire attendees, while the organization sets standards for ethics, measurement, and best practices in community management. Since that time, I've been elected to WOMMA's board of directors for two three-year terms, served as a member of the executive committee, and as board chairman. I've seen changes in our association, our membership and events. Now I'm very pleased that a commitment that we made to hold regional events last year, is continuing to grow. 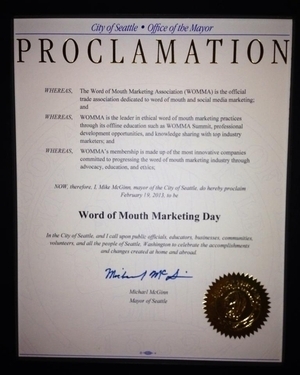 In order to enable more people to have a WOMMA experience, we've created the first ever WOMMFest to celebrate national Word of Mouth Marketing Day. On February 19th, simultaneous events will be held in Atlanta, Chicago, and Seattle. Keynotes from each city will be streamed into all venues and will be supported with local case studies and examples we all can learn from. So why should you register? It's the best opportunity you'll get in 2013 to hear three nationally renowned speakers without leaving home. No airfare, no hotel rooms, and no additional meal costs. You can experience the whole program in less than a day and for under $200 ($99 for WOMMA members). How easy is that! I'll be hosting the Seattle event at the Experience Music Project and can't wait to see a sold out venue. Whether your in Chicago, Atlanta, or Seattle it's an opportunity you won't want to miss. In 2007 I flew to Las Vegas on a recommendation. I've never regretted it. I hope you'll take my recommendation seriously. I'm confident that you won't regret it either. See you there!